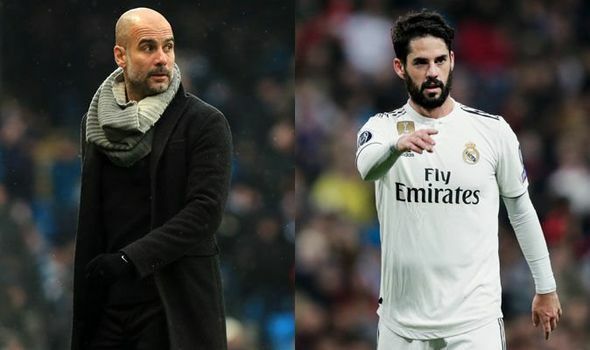 MANCHESTER CITY boss Pep Guardiola has reportedly made an inquiry for Real Madrid ace Isco, as he makes the Spain international his primary transfer target. Isco, 26, has seen his game time limited this term, making just 11 league appearances and struggling to hold down a starting berth under both Julen Lopetegui and new boss Santiago Solari. Guardiola’s Manchester City have been boosted by the return of Kevin De Bruyne in recent weeks but the 47-year-old boss still believes his side have room for improvement. Isco’s situation at Real Madrid has baffled fans in recent seasons, with his undeniable talent seemingly going to waste.